The BJP has knocked the door of the Kolkata High Court thrice now after being denied approval for Amit Shah’s rally in outside Victoria Hall , a popular site ideally preferred by TMC Supremo, CM- Mamata Banerjee. Although the BJP had applied for the ground in July, five months later – last week, the police rejected the request citing traffic problems. The city’s civic body and the fire department also reportedly cited lack of proper sketch of the stage plan as the reason for disapproval. 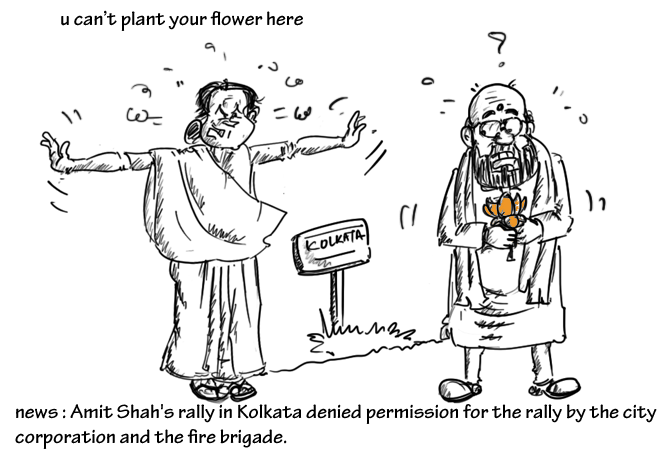 Is planting ‘lotus’ in Bengal so easy in our didi’s reign? Amit Shah who has been the ‘key’ knight for Modi in General Elections cracking difficult states like Uttar Pradesh in BJP’s favour and Maharashtra in State Elections, has a tougher competition to face.